Be sure to read our general information on repotting first. 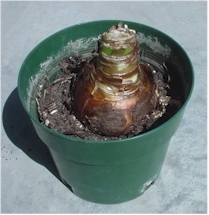 Below, is our illustrated step-by-step guide to partially repotting/refreshing your Amaryllis. The only difference if you were doing a full repotting, is that you would remove much more of the old mix at Stage 3. A chopstick or stake helps in removing old mix. Or, hold the bulb under a hose in the yard and wash off as much mix as you can. It is not necessary to remove every shred of mix and you want to damage the roots as little as possible. 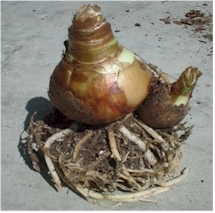 This bulb has been dormant and is ready for refreshing with new mix. You can also see some salt build-up along the inside rim of the pot. Peat based mixes often seem to become crust and turn slightly grey when they get old. 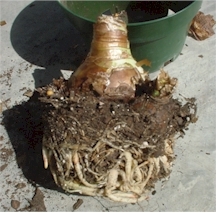 The bulb is easily removed from the dry mix. You can already see fresh new roots at the bottom! Its clear that refreshing the mix is needed as there is hardly any mix visible at the bottom. You will note that there is a baby bulblet attached to the mother bulb-this is easier to see in the next photo. A chopstick or stake is helpful in working out the old potting mix, along with shaking the bulb gently. Look carefully, and you will see that almost all the old mix has been removed all the way to the base of the bulbs. Further removal of mix would require disturbing, and destroying, some of the roots. Since the new roots are well along, its better not to disturb them further. 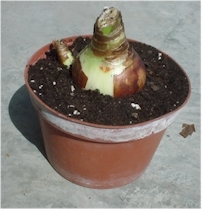 This bulb will do fine with refreshing and can be fully repotted in a year or two, preferably a little earlier (before roots have grown this long). The newly potted bulb! Note that the top 1/3 to 1/2 of the bulb should always be exposed. Never cover the bulb with mix all the way to the neck. In this case, we have also decided to leave the bulblet on the mother plant. We have also removed some of the dead scaly coverings on the bulb to reduce chance of disease and pests. The fresh mix has been thoroughly worked in between the roots with a stick and tamped down so the bulb is firm in the pot. Water the plant once thoroughly and then place it in a bright spot (see Spring Care).